In life we can see the floor anywhere, it widely used in interior and outdoor, at present there are many types of floor on the market, have all kinds of different materials for us to choose, mostly made of wood, after a few years the product will rot and fade, and the wood floor is not waterproof, so you need to spend a lot of time to maintain it, wood plastic composite materials is new composite materials can replace wood and plastic. At present our company’s wood plastic composite floor export to more than 100 countries, and build distributor in different country, wood plastic floor products in addition to the texture of wood, there is the acid, moisture-proof , anti-moth and other characteristics, can be widely for landscape, gazebo, indoor and outdoor ,the wood plastic composite except flooring, also have fence, wall panel and other product . 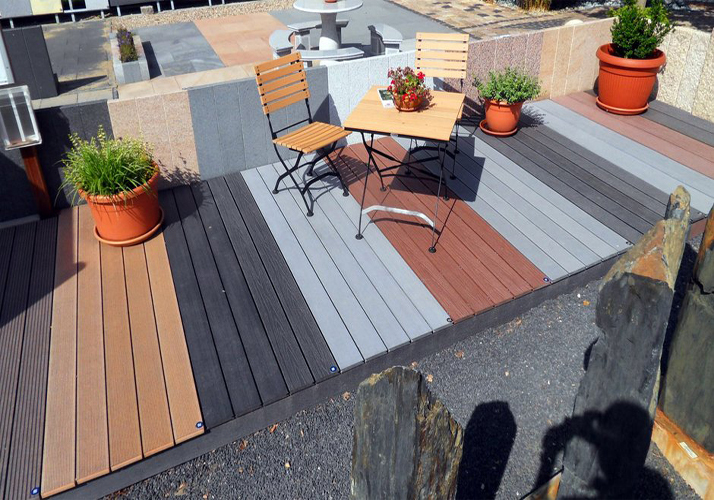 meanwhile wood plastic composite floor is several times the life of ordinary wood, the color can also be adjusted according to customer requirements. WPC floor applications can save a lot of natural wood, help protect the environment, because the ingredients with natural fibers, wood has better resistance to ultraviolet performance and lower thermal expansion and contraction properties, and the like wood as easy to process. 2. Wood plastic composite life more than tradition 3-4 times . 3. With widely color , size and style can be option . 4. Easy care and clean , save you lots of time . 5. Safe , waterproof , anti-slip and long life .